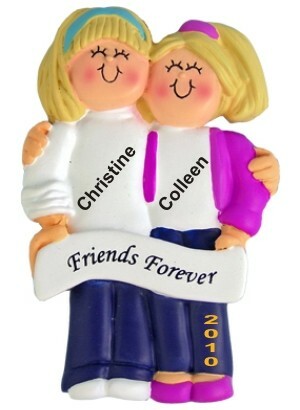 Celebrate the joys of friendship on any occasion with the female blonde friends personalized Christmas ornament in bright colors and adorable smiles! These very popular friends ornaments personalized for the two of you are preprinted with "Friends Forever," and we'll hand paint the names and year to make them really special. Many BFFs have a pair of the both blonde friends personalized Christmas ornament made up, so each can have a memorable keepsake of a very valued friendship.